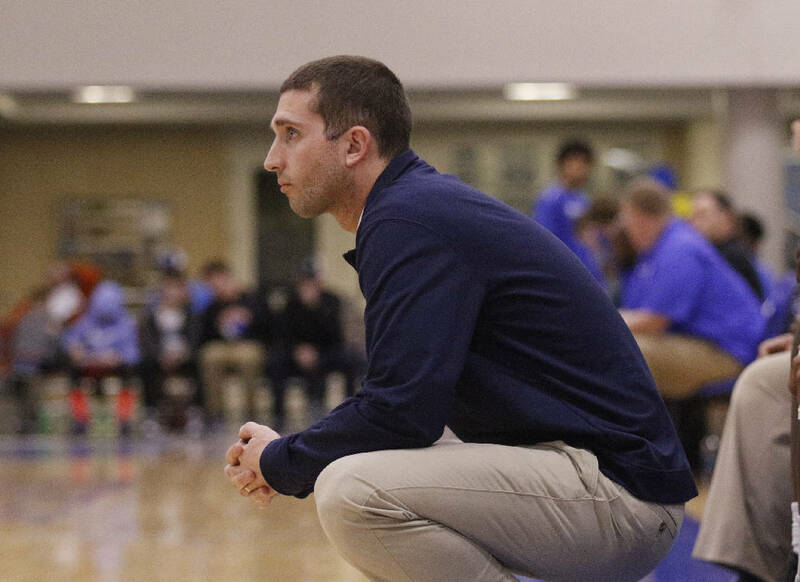 Hamilton Heights basketball coach Zach Ferrell watches a Hawks game in February 2017 at McCallie. Shai Gilgeous-Alexander dribbles down the court during Kentucky's first-round NCAA tournament game against Davidson in March. 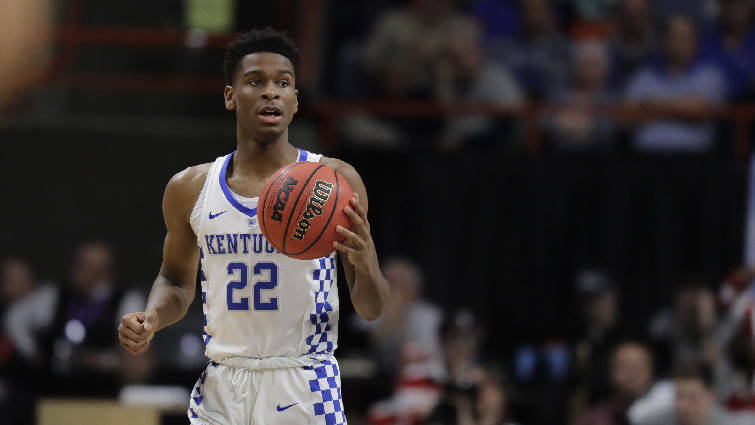 Gilgeous-Alexander, who spent two seasons at Chattanooga's Hamilton Heights Christian Academy, is expected to go early in tonight's NBA draft. Two weeks shy of his fourth birthday, Peyton Ferrell is normally in bed by 7:30 each evening. But not tonight. Not with his all-time favorite basketball player — former University of Kentucky point guard Shai Gilgeous-Alexander — expected to be a lottery pick after coverage of the NBA draft begins at 7 p.m. on ESPN from the Barclays Center in Brooklyn, N.Y. According to Peyton's father Zach — who coached Gilgeous-Alexander for two years at Hamilton Heights Christian Academy — bedtime is altered pretty much any time SGA, as he has come to be known of late, is on television. "If Shai's on TV, Peyton's probably watching," Ferrell said. "So he'll definitely be watching the draft tonight. Hopefully, he won't be watching it for long." That's because SGA is widely projected to be among those first 14 lottery picks, slotted anywhere from No. 8 (Cleveland Cavaliers) to No. 9 (New York Knicks) to No. 11 (Charlotte Hornets) to the Los Angeles Clippers, who hold both the 12th and 13th selections. There's even talk of his hometown team, the Toronto Raptors, trading up to get him, though they have no draft picks in either round. But wherever SGA lands, Peyton's pop intends to be there in the Barclays stands, having booked a flight to New York that was expected to leave Chattanooga at 5:45 this morning. "I'm not sitting at the table with him and his family," Ferrell said Wednesday evening. "I'll just be in the stands, cheering as loud as I can when they call his name. He knows I'm coming, but I didn't want him to worry about coordinating anything with me. I just want to be there to support him." If anyone underscores the need to not always support the opinions of recruiting services, it's Gilgeous-Alexander, who was viewed as the least likely member of UK's second-ranked 2017 recruiting class to jump to the NBA after a single season. "Everybody, all these recruiting experts, all these NBA scouts, told me he'd be a four-year (college) player," recalled Ferrell, who played at the University of Tennessee at Chattanooga. "A lot of them thought he had a chance to play in the NBA, but that he'd probably need four years to get there." Indeed, for the first six weeks of this past season, SGA wasn't even the starting point guard, sharing time with fellow freshman Quade Green. But then he exploded for 24 points against Louisville, 30 against Vanderbilt, and a three-day onslaught in the Southeastern Conference tournament led to him being named its MVP. Suddenly, he was viewed as an all-but-certain lottery pick, which led him to forgo the rest of his collegiate career for a contract that will likely pay him more than $3 million a year. But as good a player as the 6-foot-6 Canadian has become on the court, Ferrell believes it's his character off the court that has sold more than one NBA team on his potential. "Shai's a very, very safe investment," he said. "And that's important when you're handing a 19-year-old kid a multimillion-dollar contract. He checks all the boxes: coachable, disciplined, hard-working, bright, great motor, high character. He's exactly the kind of player and person you want in your organization." To look at this draft is to question if at least some of the players currently predicted to go above SGA fill as many boxes, beginning with former Arizona star Deandre Ayton, who is expected to go No. 1 to the Phoenix Suns, despite Ayton or someone close to him having been alleged by the FBI to have accepted $100,000 to play for the Wildcats. Beyond that is how many of these players have that championship mindset, given that of the 11 players currently projected by NBADraft.net to be picked before SGA, none willed their schools to the Final Four and only Duke's Marvin Bagley and Wendell Carter reached a regional final. Not that SGA accomplished that, either. Playing on the youngest team in men's college basketball last season, the one-year careers of SGA and fellow expected lottery pick Kevin Knox ended in a Sweet 16 loss to Kansas State. That doesn't mean that the expected top of this draft — Ayton, Bagley, Jaren Jackson and foreign product Luca Doncic — won't become all-stars, though only the ridiculously versatile Bagley currently looks as if he could become an all-time great. What was an eye-opener to Ferrell was how thorough the dozen or so NBA scouts who phoned him about SGA were with their questions. "The one that caught me most off guard was when one team asked me who I thought Shai would live with his first season," Ferrell said. "I'd never thought about that. But if you're that team, you want to know who's watching over a 19-year-old kid who's never been in an unstructured environment before. I don't know this, but I'm guessing Shai's mother might live with him that first year." For selfish reasons, Ferrell hopes SGA will wind up living in Charlotte, Atlanta or Memphis, all easily driveable locales. But that's for later. Tonight is all about an expected four-year project becoming a projected lottery pick in a single season. "It's not every day that a kid you coached, a kid who lived with you and your family for two years, becomes an NBA lottery pick," Ferrell said. "I may coach the rest of my life and never have this happen again." And given that, how could Peyton not stay up a wee bit later than normal?